[Otermrelik] wanted to experiment with the Teensy audio library and adapter. That, combined with his 3D printer, led to a very cool looking build of the teensypolysynth. The device looks like a little mini soundboard with sliders and 3D printed knobs. You can see (and hear) it in the video below. The Teensy audio library supports several output devices including several built-in options and external boards like the audio adapter used here. The library does CD-quality sound, supports polyphonic playback, recording, synthesis, mixing, and more. Even more interesting is there is an audio design tool that runs in your web browser for building the audio portion of your code graphically. Even though it is in a browser, it isn’t tied back to a server so you can run the tool offline and you don’t have to worry about your world-changing audio design leaking out on the Internet. Browsing the tool is a good way to get a feel for just how much capability the library provides. The build details are a little light, but between the code, the pictures, and the 3D printable files you can probably figure it out. Your layout might be a little different, but you’d probably want that anyway. 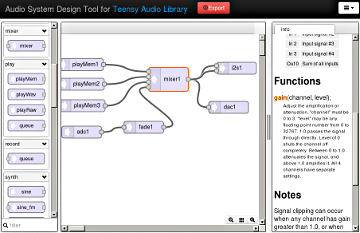 We’ve talked about the Teensy audio library before, and we are still impressed. If music synthesis isn’t your thing, don’t worry. You can’t help but love this voice changer. I’d argue the 3D printer in this case isn’t necessary… there are project boxes available that would likely look as good if not better. That said, he’s done a nice job designing it all. The audio library is doing all the heavy lifting of course, but it sounds like a quite capable synth. The fact it has less than one 10th of the buttons of a regular synthesizer keyboard doesn’t appear to be much of a limitation here. My friend’s one year old has a keyboard with a similar type of limited musical ability. Not much different than taking a lot more than just the W off of the textual keyboard. Find a thrift store kids full keyboard and hack it to the rest of what you have. Yes, a retro or modern ready made case still has more going for looks than most 3D prints. One could easily stuff the project into one of those gaudy colored dinosaur shaped keyboards! Pianosaurus, it was mechanical tinkle bell style toy. Another alternative is to make a 3D print that is novel not just another squared box. The advantage of stuffing electronics into an existing keyboard is that you can use the useless “demo” button to play Shooting Stars (the one from 2009) and dive into space. Stop using 3d printers to make boxes. It looks like garbage every time.